A Navy SEAL who first overcame a crippling childhood condition and then a devastating training accident offers his own experiences as lessons in defeating adversity. Patrick Bisher’s career as a Navy SEAL should have ended after a parachuting accident nearly crippled him. But overcoming adversity, even an injury as serious as a broken hip, was nothing new for him. He’d spent a portion of his childhood in leg braces. Doctors told him he’d never walk again thanks to a degenerative hip condition. He wasn’t about to give up then, any more than he was in the wake of that parachute training accident. Instead, he went on to serve in combat as a member of SEAL Team Seven, seeing action in Iraq and ultimately winning the Army Commendations Medal, among other awards. Now Patrick wants to take the lessons he learned on and off the battlefield and apply them to everyday life. He offers inspiration to all who’ve faced the kind of adversity he has. In chapters drawn directly from his own experience, he sketches a heart-wrenching tale of salvaging lifelong victories out of crushing defeats, and hope out of heartache. From being branded a “cripple” to successfully negotiating BUD/S (Basic Underwater Demolition/SEALS) training, from agonizing pain to heroic achievement, from devastating loss to finding his faith, Patrick’s story is one of discovering ways to do everything he possibly can, instead of making excuses for what he can’t. An American hero who never surrendered is now sharing his lessons with those fighting their own battles to emerge from their dark places into the light and lead a better, more productive life. "Patrick Bisher's story of overcoming adversity as a child and then as a Navy SEAL is inspiring, riviting, and informative. Patrick's story and lessons will inspire everyone and should be read by all. As a retired brigadier general with combat experience in Afghanistan, I was riveted by Patrick's grit and perseverance and humbled by his never give up atitude. A must read!" "I couldn't put it down. A memoir that reads like a thriller, and a real-life hero who pushes through unimaginable obstacles, No Surrender is not only an aptly-named book, it's also a winner." "It was an honor to be given the first few chapters of Patrick Bisher's book. Having had the honor to serve with the SEAL's myself, I can say that Patrick epitomizes the SEAL ethos. 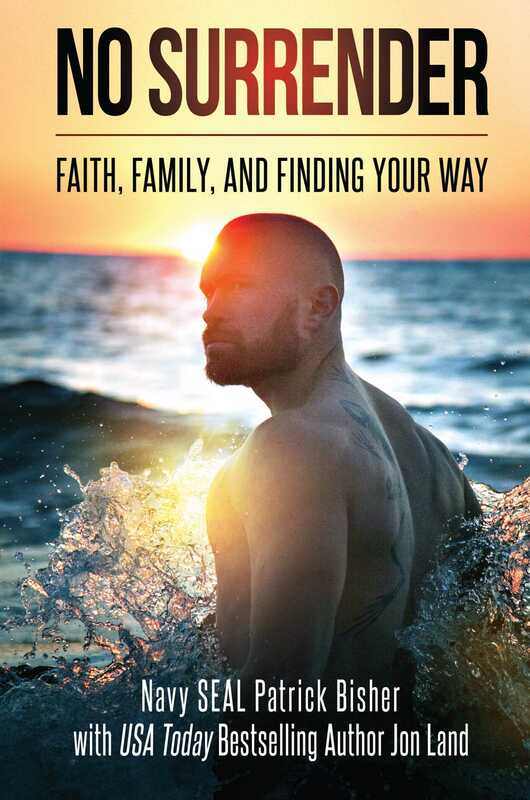 Unlike the "tell-all" books of late, Patrick Bisher's inspiring story sends a positive message of how one man can overcome anything through faith and integrity. From crippled boy to Navy SEAL, to injured Team Guy and back again to his unit, Patrick's story is one of perseverance, tenacity, triumph, and how determination and faith can overcome all obstacles. Expertly told with the help of bestselling author Jon Land, I have no doubt this book will be an instant succes and will touch and change many lives." "No Surrender is a true story of perseverance, and overcoming huge obstacles all while keeping a never quit/never give up attitude. The same mental toughness exhibited at age 9, got Patrick through SEAL training as a grown man. As a former SEAL Sniper, I am humbled by this man's story and it will inspire anyone who reads it." "Based on the true story of one man's journey of strength and courage. No Surrender is perfectly titled and wonderfully inspirational." "Almost every event in this well-written memoir serves as an encouraging reminder of the importance of not giving up, even when the road ahead appears too rocky to traverse. Engaging discussion questions at the end of each chapter also ensure Bisher's points hit home. Thought-provoking and ultimately uplifting, this story, helped along by author Jon Land, is a journey worth savoring and will inspire all." "This wondrously written tale, chronicling the improbable route Navy SEAL Patrick Bisher followed in becoming a true American hero, rings true as an inspirational catharsis of rare depth and pathos... No Surrender is one of those rare true-life tales that wraps all three acts into a tight, taut package. The beginning, middle, and end are as heart wrenching as they are heartfelt for different reasons entirely, but no less mesmerizing and magical in tracing Patrick's circuitous climb to joining the ranks of the elitist of American's warriors. A testament to perseverance and the triumph of the human soul, making No Surrender a masterpiece of introspection and a memoirist classic that is not to be missed." "Patrick Bisher is a name that, after No Surrender, is now synonymous with resilience, with humility, with hope, with courage, and with sincerity... Emotionally engaging, spiritually enriching storytelling forms the core of this book. No Surrender is about not only reaching your goals, but figuring out how to set them in the first place." "Reads like a page-turner of an action novel rather than a work of nonfiction. No Surrender is a great read and is highly recommended for anyone who thinks they are unable to overcome the worst that life has thrown at them. Patrick Bisher is a living example that anyone can stand up, fight their private battles and never surrender."